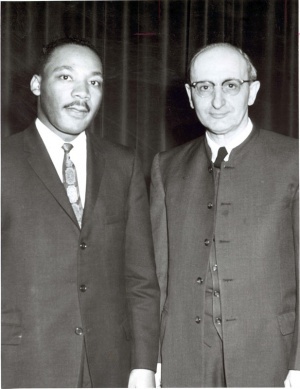 Martin Luther King with Guy F. Hershberger at Goshen College, March 1960. Guy Hershberger was born 3 December 1896 in Johnson County, Iowa, the first of nine children of Ephraim D. and Dorinda Kempf Hershberger. He was baptized in 1909 at the East Union Amish Mennonite Church. After graduating from high school in 1915, he taught in rural schools until his marriage to Clara Hooley, of Goshen, Indiana, on 1 August 1920. Their two children were Elizabeth (Bauman) and Paul. Guy and Clara both enrolled at Hesston College in the fall of 1920 and graduated in 1923. He taught in the Hesston Academy, 1923-1924, while Clara served as dean of women. After Sanford C. Yoder, formerly the pastor at East Union, invited him to join the faculty of the reopened Goshen College, Hershberger earned an MA degree at the University of Iowa in 1925. Further graduate study at the U. of Chicago and Iowa led to the PhD degree (Iowa, 1935), with a dissertation on Quaker politics in colonial Pennsylvania. Hershberger's long career at Goshen, teaching history, sociology, and ethics, began in 1925. He helped found The Mennonite Quarterly Review (1927) and continued on its editorial staff throughout his life, serving as editor in 1963-1965. In 1925, Orie O. Miller, secretary of the Mennonite Church's Peace Problems Committee, enlisted Hershberger as an ally in the cause of peace education and activity, although Hershberger was not a member of the committee until 1959. Hershberger's life-long interest in broader peace circles began in 1927 at the St. Louis conference of the World Alliance for International Friendship Through the Churches. The need for peace literature for Mennonites led to a series of articles in the Youth's Christian Companion that were later published as a book, Can Christians Fight? (1940). Hershberger introduced peace concerns into the college program by building up a peace library, launching the Peace Society, and teaching his basic course "War, Peace, and Nonresistance" to hundreds of students. At a Mennonite peace conference in 1935, Hershberger presented a paper that became the foundation for the alternative service program of World War II. His major work War, Peace, and Nonresistance appeared in 1944, with revisions in 1953 and 1969. He published The Mennonite Church in the Second World War in 1951. In 1939, a second career focus emerged with the forming of the Committee on Industrial Relations (MC), later the Committee on Economic and Social Relations. As its executive secretary from 1939 to 1965, Hershberger led the way in shaping a Mennonite social ethic which was spelled out in The Way of the Cross in Human Relations (1958). Along with many significant writings, Hershberger also expressed his vision through his role in the founding of Mennonite Mutual Aid (1945) and the Mennonite Community Association (1946). In the 1960s, he gave guidance to the church's response to the civil rights movement. After retirement from Goshen College in 1966, the Hershbergers moved to Phoenix, Arizona where he remained active in writing and speaking on the ethical issues facing a changing church. In 1985, they returned to the Goshen area, residing at Greencroft. Guy Hershberger died 29 December 1989. See also interviews with Hershberger by Melvin Gingerich, 1975, transcript in Archives of Mennonite Church USA (Goshen, Indiana) and excerpts in Mennonite Historical Bulletin 48 (January 1987). Warkentin, A. and Melvin Gingerich, compilers. Who's Who Among the Mennonites. North Newton, KS: Bethel College, 1943: 103-104. Gospel Herald (3 March 1987): 146-148. Burkholder, John R. "Hershberger, Guy F. (1896-1989)." Global Anabaptist Mennonite Encyclopedia Online. 1989. Web. 24 Apr 2019. http://gameo.org/index.php?title=Hershberger,_Guy_F._(1896-1989)&oldid=160417. Burkholder, John R. (1989). Hershberger, Guy F. (1896-1989). Global Anabaptist Mennonite Encyclopedia Online. Retrieved 24 April 2019, from http://gameo.org/index.php?title=Hershberger,_Guy_F._(1896-1989)&oldid=160417. Adapted by permission of Herald Press, Harrisonburg, Virginia, from Mennonite Encyclopedia, Vol. 5, p. 369. All rights reserved. This page was last modified on 13 April 2018, at 12:34.